VallartaJoy SM has enjoyed over 15 years of successful real estate investing and rental property management assistance in the US and abroad. It began investing in Nuevo Vallarta in 2000. As the Canadian developer of Paradise Village TM completed several of its fully deeded beachfront condominium projects, we recognized the need for an effective, responsible rental program to help property Owners realize annual rental income. Since then, VallartaJoy SM has grown to its current inventory of over 60 properties all over Vallarta. We welcome inquiries about our program. Click Here to fill out the Rental Description Form. Periodically VallartaJoySM Rentals has openings and the capacity to accept new vacation homes that meet our specifications and requirements which are consistent with our guests’ expectations. We review every request and will discuss our rental management program with you and inform you if we are able to assist you at that time. We try to balance our inventory of homes with supply and demand so that Owners are able to achieve their rental income expectations from our assistance. Our full-service rental program manages the process and the people from finding rentals to checking out departing guests-- and ensuring your home is in the same excellent condition as at the start of the rental. We manage all the paperwork, collection, deposits and payment processes for each rental. We require prepayment from qualified renters, so Owner Members receive their net rental check in advance of each rental. It’s easy, low maintenance and reliable. 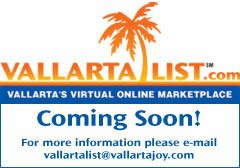 Feel free to contact us at homelist@vallartajoy.com. We help you defray ownership costs by assisting you generate rental income. We employ a multi-faceted marketing program to find high quality responsible renters who want to enjoy vacationing at your luxury vacation condominium or villa. We work for you on a non-exclusive basis to manage the entire rental process from start to finish. You are free to generate your own leads, and use other services or agents to help you generate rental income. We want you to be satisfied with our service and us with your cooperation, so although we memorialize our respective expectations in a written agreement, we are each free to terminate our relationship at any time with specific notice. OUR SATISFIED PROPERTY OWNER/CLIENTS AGREE THAT THE BEST FEATURE OF OUR PROFESSIONAL SERVICE IS THAT YOU RECEIVE YOUR NET PROCEEDS CHECK 55-25 DAYS BEFORE THE RENTAL OCCURS! Click Here for more Information on VallartaJoy's Vacation Rental Property Management Services.